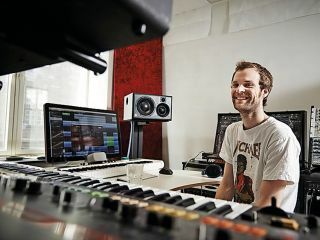 PRODUCTION EXPO 2014: With remixes under his belt of everyone from Hot Chip and Franz Ferdinand to The Bee Gees, Bryan Ferry, Michael Jackson and Chic, it's fair to say that Terje Olsen (aka Todd Terje) knows his way around a disco edit. What's more, in recent years he's notched-up a string of bonafide club anthems all of his own, most notably in the form of 2012's joyous, all-conquering synth jam Inspector Norse. In April Terje released his debut LP, It's Album Time, a record that saw the Scandinavian widening his concept by experimenting with new tempos and song structures, and even colluding with debonair glam rocker Bryan Ferry. In this interview he talks about remixing, writing and his love of classic synths. You're known for being a prolific remixer. How do you approach reworking someone else's track? "I think I've moved away a little bit from dancefloor stuff. I always like to find parts of the piece where you can actually play it. I did a remix for Bombay Bicycle Club a couple of years ago. I don't think anyone really knew what to do with it, but personally that's one of my favourite remixes. "Tempo is a big thing; if you know it's going to be early [in the set] then you need to create it at around 115 bpm, and if you're aiming for the dancefloor you might go as high as 128. But that is just setting the boundaries, you still have to make the music exciting and have some good ideas." Why did it take you so long to release It's Album Time? "I don't really have a good answer for that. I always wanted to do an album but never saw it as very important. A lot of big artists think the album is the most important thing you can do, but I've been a DJ for so many years now that I know that a good single can take you a lot further than a mediocre album. But now I'm really happy that I did the album and can see that it's opening a few doors that the singles couldn't." "I had this idea that the music would describe a journey, like for instance, the movie Around the World in Eighty Days. They would visit all these different countries and go through different situations; underwater, on the sea, by train and car, like an exciting adventure. But I'm not a sound designer, so that didn't work very well [laughs]." You're known for your use of classic synths, particularly the ARP 2600 and Odyssey. What is it you particularly like about these instruments? "They just want to be played, you know? Especially the 2600, as you don't actually need anything else. There are very few instruments that are so inviting and it's quite comprehensive; you can pretty much do anything you want. In fact, I did the Inspector Norse EP just through that synth. You can make simple bread and butter sounds really easily, like spaced-out BBC-style sound effects." "A good single can take you a lot further than a mediocre album"
"The Odyssey has a keyboard, so it has more limited features, but what it does it does really great. If you're playing by hand and want to find a bassline that's inspiring and sounds good immediately, the Odyssey sounds great from almost every setting. I have a lot of other synths that don't sound as good to my ears right away, and I need an instrument that can inspire me fast, because I make music fast. I like a lot of those '80s sounds; the guy from Ultravox that went solo, John Foxx - he was big on the ARP Odyssey. The way he used it was quite similar to how I used it. I don't like it when you take a great instrument and ruin it by trying to make the weirdest sounds possible." What does your Jupiter-4 bring to the table? "The Jupiter-4 was one of my first. Today I have many more polys, like the Jupiter-8 and the Memorymoog - a lot of good stuff - but there's just something about the Jupiter-4 and how you interact with it. You have faders instead of knobs and everything is driven internally. I like working with the envelopes; the JP-4's filters are what makes it unique - it sounds great without having to process the sounds afterwards. I use an IO MIDI Kit with the Jupiter-4, so you can make a MIDI track in Cubase or whatever, but in addition to normal MIDI it does a lot of other functions. You can pretty much automate every parameter, so if you don't want to touch the Jupiter you can do it all by MIDI, and in addition to that it has four times the memory." "Yep. I mainly use it for hi-hats; it's also got bass, kick, snare, tom toms - that's about it. It was at the time that I was quite inspired by analogue drum machines, but I never really got it to fit in the mix. There are many good things about analogue drums, but bass drums should be quite tight in my opinion, and the bass drums that you create from analogue drum machines can be quite loose, so I never really got any satisfying sounds from that. A hands-on drum machine usually has an internal sequencer, which is good for making ideas, but I would never use it in a production." "I need an instrument that can inspire me fast, because I make music fast"
I noticed you also use the Boss DR-55 drum machine and a LinnDrum Mk2. Are you sampling them or programming? "I like the Boss DR-55 for the sound; I can get good samples out of it. But the LinnDrum is a different thing because it uses digital samples in the box, so if you can get your hands on the original sample then the box becomes obsolete. There are some things with the LinnDrum that I like to do. With normal drum sequencers every sample is played at exactly the same time; however, on the LinnDrum the hi-hat comes a little bit before the kick and the snare comes after, so there's a wobbly offness to it." You use Cubase as a DAW. What attracted you to that software over the likes of Logic or Pro Tools? "It's just easier I think, although the multi-window thing kind of puts me off as there's so much that you have to do with your mouse. My arm hurts just by thinking about Cubase. Right now I'm in a transitional phase - I'm thinking of switching to Logic. At the beginning, Cubase was a very easy way to get into music production, instead of Fruity Loops or Acid, or whatever was available, and I thought Cubase was going to be as smooth on Mac as PC; but the programme quits unexpectedly at least five times per day, which makes me want to throw it out the window." What are your favourite virtual synths and plug-ins? "The Diva thing, by u-he - that's definitely my go-to synth. It feels very similar to the Jupiter and resembles synthesizers that I know quite well. It takes me less than a minute to create the sounds that I want and it sounds really wonderful. You can also have as many copies as you want open in a project. For plug-ins, there's one called Brainworx Digital V2 EQ, which is my bass surgery plug-in, and also the one I use to check phase, stereo widening and compatibility. The Valhalla Vintage Reverb is also really amazing; it's quite resource light as well. And the Voxengo Elephant's really nice too; I use that for simple limiting. The SPAN audio spectrum analyser is great to check what the music looks like."